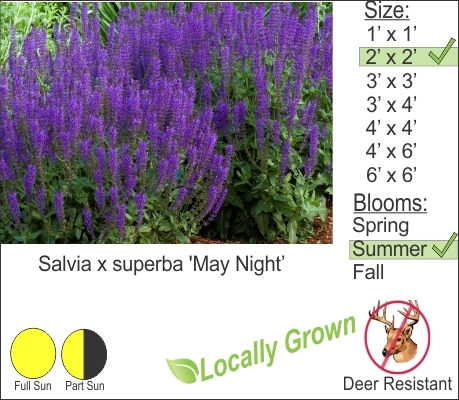 May Night Sage has low compact mounding soft foliage and creates beautiful blue indigo flowers in the summer. This deer resistant perennial is perfect for borders in the landscape and mixes well with other perennials. You can place Salvia in containers or mix it with low growing flowering shrubs like Gold Mound Spirea. The yellow color of the spirea leaves show well with Sage.